The cycle is one of those eye opening ideas, a meme that explains while also laying out a way to look forward. Like disruptive vs evolutionary technology, the 80/20 rule and others. 3ders noted it because several things on it this year that are near and dear to their hearts. 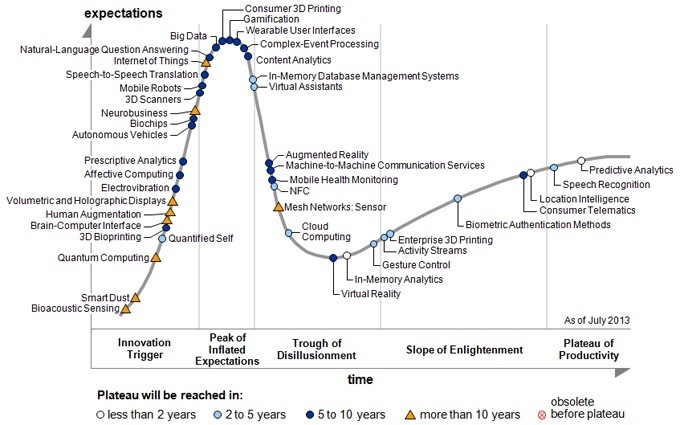 Personally Gartner’s timeline for consumer 3d printing, from the peak of hype (this years tip) to the plateau of acceptance is to conservative (5-10years). I think more like 3 to 5 years, but we shall just have to wait and see. This entry was posted in culture, Technology and tagged Explanatory, meme by Sci Fi Engineer. Bookmark the permalink.